Vintage glam weddings are en vogue this season. 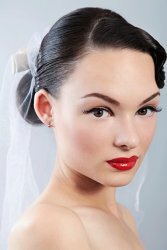 You could design your wedding after the 60’s with a chic look that Marilyn Monroe or Audrey Hepburn would approve of, or you could design your look in the time of the 40’s with finger waves, bowties, and well-placed antiques as centerpieces. For a look modeled after the Roaring 20’s with all the glamour and romance reminiscent of The Great Gatsby, try adding vintage hair accessories with bold, richly colored fabrics and jewelry. Consider shopping on Etsy’s All That Jazz Design or Vintage Pearl Clothing for the Cat’s Meow of headbands and birdcage veils for you and your maids.